The second box I opened on my birthday, this box of 2003 Topps Finest was originally videotaped, but due to the horrible overall quality (lots of lag, audio distortion), the video was never published. As you’ll see, it was a pretty darn good break. Uncirculated Box Topper (numbered to 199, 1: box): Each master box is accompanied by a silver pack holding an uncirculated Gold X-Fractor. Numbered to just 199, these gold parallels mirror the entire set, autographed rookies included. 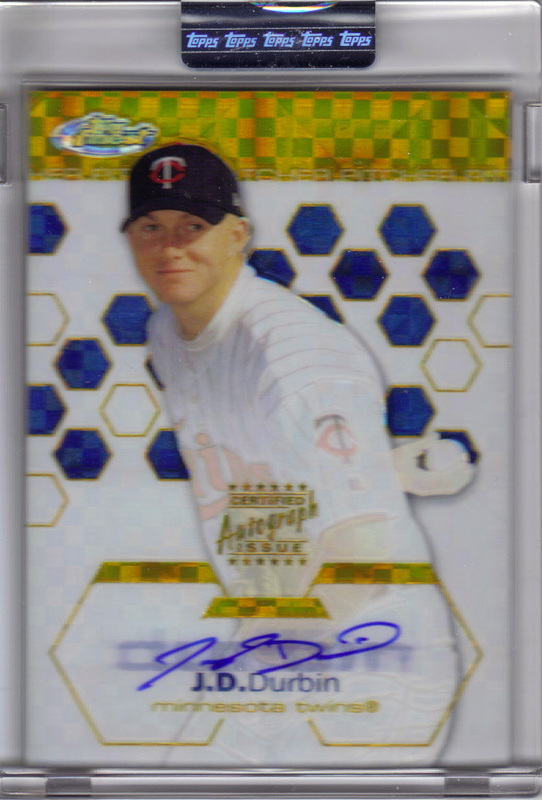 It just so happens that my Gold X-Fractor was a signed rookie card of J.D. Durbin (030/199). Durbin was a prized possession of the Minnesota Twins’ Minor League organization, and even received their Pitcher of the Year Award in 2002. He is currently a free agent. Base set: The base set is comprised of 100 short set cards, followed by 10 short-printed, autographed rookies. 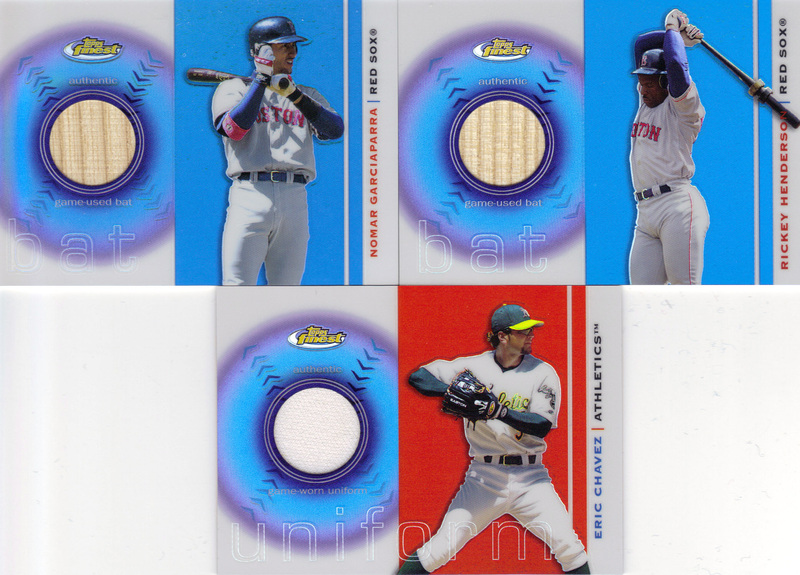 As was the norm with that era of Finest, each base card has a unique color background, influenced by the depicted player’s team. My box yielded 85 out of 100 short set cards (85%) and no duplicates. 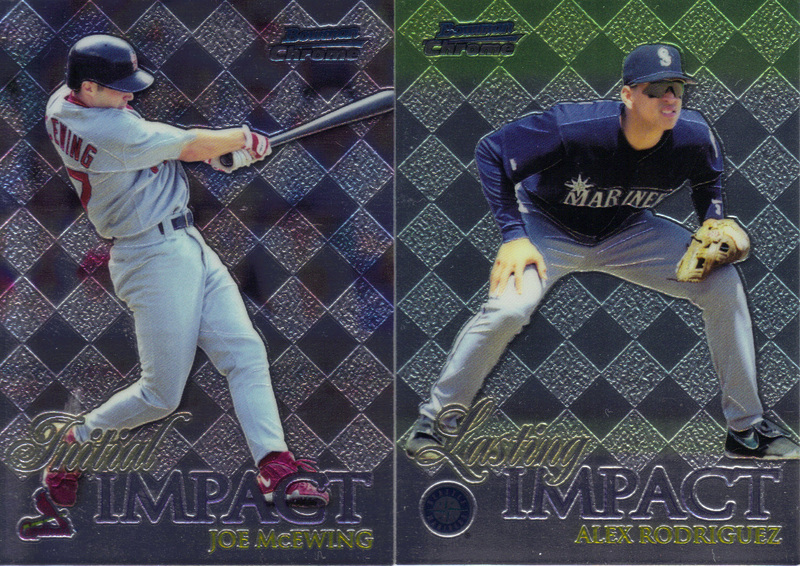 Refractors (1: mini box): One of the key differences between 2003 Finest and say, 2009 Finest lies in the refractors. 2003 Finest does not have the bevy of colorful refractors that collectors have become accustomed to in recent years (red, green blue, gold, black, etc.) Instead, only basic Refractor and X-Fractor parallels exist (box toppers aside). The basic Refractors are seeded at a rate of 1 per mini box (SP’s 1 in 34) while the X-Fractors are seeded at a rate of 1 in every 7 mini boxes (SP’s 1 in 68). I did not pull any X-Fractors in this box, but I did pull basic Refractors of Tim Hudson, Larry Walker, and Barry Zito. I’m sure I will be sending the Zito out to New Mexico sometime. As for the Walker, it came out of the pack with significant damage to its back (a giant scrape). Why did it have to happen to a Refractor?? I pulled bat cards of Nomar Garciaparra (Group A) and Rickey Henderson (Group J) as well as a uniform card of Eric Chavez (Group B). 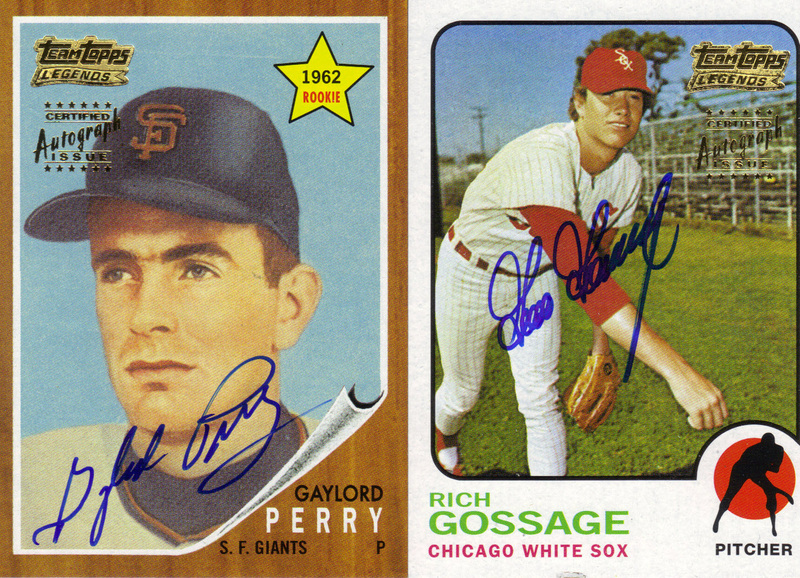 Team Topps Legends Autographs (10 cards, randomly inserted): And now, here are those Hall of Fame autographs I mentioned in my last post. 10 Team Topps Legends signed cards for this special set, and just like the relic cards, each autograph belongs to its own specific group. The complete checklist is below, pulls highlighted in bold. Overall, autographs (rookies, Finest Moments (link), and Team Topps Legends) fall at a rate of 2 per master box. For the second straight break, the box delivered the inserts and “hits” perfectly, all without a single duplicate. Very nice. Condition was the only issue I had in this box. In fact, if it weren’t for this category, this box would get straight A’s across the board. Only 2 cards from this box came out of the pack with noticeable damage, but considering that both of those were chase cards (Walker Refractor, Gossage autograph – look at the blemish on the front, towards the bottom), I had to drop this down a grade. Regardless of where you purchase this box, you should be able to find it for less than $80. For that price, you should find a nice little box containing 5 hits (3 relics, 2 autos), 3 Refractors, a Gold X-Fractor, and possibly one more X-Fractor if you’re lucky. I’d say go for it. 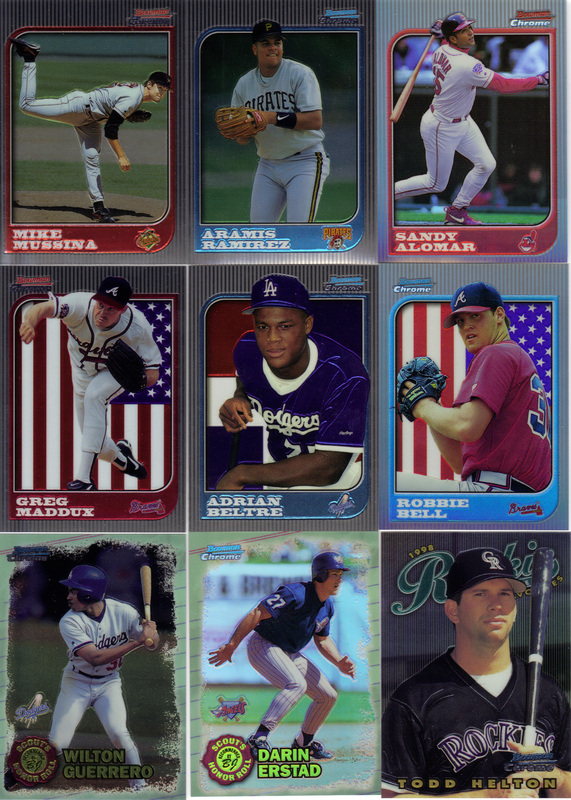 Base set: The base set is comprised of 200 cards: 85 veterans (gold background), 15 Best Performers (bronze background), 50 prospects (silver background), and 50 rookies (blue background). The last 50 rookies are shortprinted and seeded at a rate of one per pack. Altogether, I pulled 136/200 basic cards (68%) with just a single duplicate (Barry Bonds)! 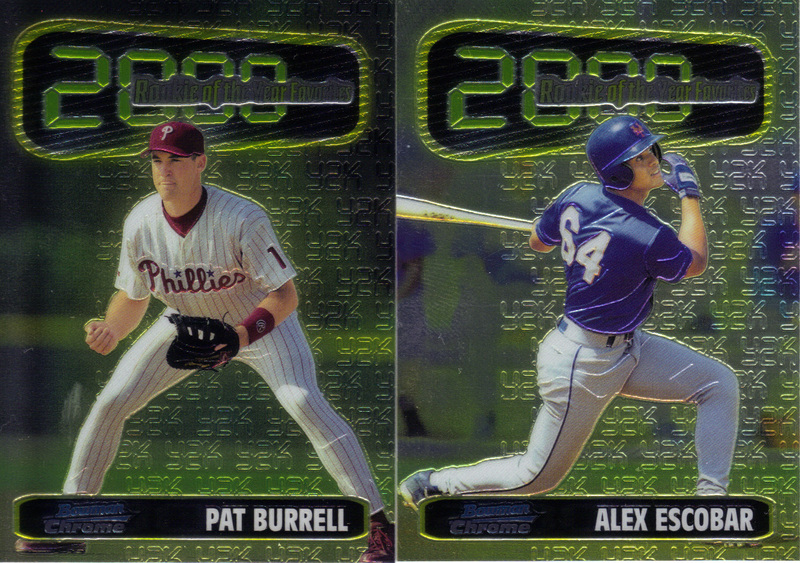 My notable rookies included Pat Burrell, Alfonso Soriano, Carlos Pena, Matt Holliday, A.J. Burnett, Mark Mulder, and Nick Johnson. Refractors (1:15 packs, /400): Seeded at approximately two per box, the refractors mirror the entire set and are serially numbered to 400. My two refractors were Tony Gwynn (071/400)(PunkRockPaint?) and Doug Mientkiewicz (RC – 015/400). Atomic refractors also exist in this product are numbered to just 100, but I did not pull any. Mirror Image (10 cards, 1:24 packs): The dual-sided Mirror Image insert cards returned in 1999 and they were very…..well….blue. 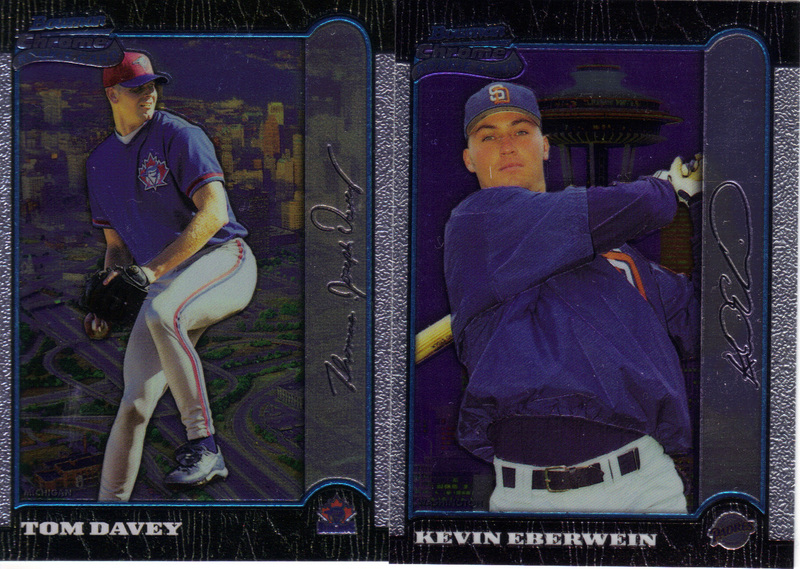 Like always, these cards featured the pairing of a Major League star with a promising prospect from the same team or of the same position or in some cases, both, such as the case of my Greg Maddux/Bruce Chen card. These inserts are mirrored by Refractor (1:96 packs) and Atomic Refractor (1:192 packs) parallels. Franchise Favorites (6 cards, 1:40 packs): There are six total cards in this set: Derek Jeter, Don Mattingly, Scott Rolen, Mike Schmidt, and combinations of the two Yankees and two Phillies respectively. I pulled Don Mattingly. Each of the six cards has a very rare autographed variation as well. Each of the four single autographed cards have a seeding rate of 1 in 1,550 packs while the duals have a seeding rate of 1 in 6,174 packs. My pull was a Mach I of former Rockies prospect Derrick Gibson (1796/3000). Franchise Best (10 cards, 1:41 packs, /3,000): The Franchise Best inserts are virtually identical to the Future Foundations inserts in that the set size, insertion ratios, and even the parallels are exactly the same. The only difference, of course, is that this set features veterans and not prospects. Once again, the regular version is referred to as Mach I and is accompanied by refractor (Mach II) and atomic refractor (Mach III) parallels. In this box, I pulled both a Mach I (1938/3000) and a Mach II (0528/1000) of Alex Rodriguez. One duplicate. That was all. I don’t think I’ll ever have that kind of great collation again. This grade goes without saying. Some dirty surfaces and scratches on the glossy backs bring the box’s grade down a little. Most of the cards came out of the packs fine but a few were downright terrible. There was no autograph or game-used card, but this box was still very strong: Maddux insert, Mattingly insert, two A-Rod inserts, a Gwynn refractor, and several good rookies. I now also have a nice starter set with minimal extras. I’ve seen this box listed in several places for about $50 or so but if you look, you could get it for as cheap as I did. For $37, you’ll be able to pull a nice array of attractive inserts, a couple refractors, and you’re sure to improve your rookie collection. Some cards may have condition issues but they’ll likely be far in the minority. This box is still a winner. Base Set: As was the case with Series 1, the base set in Series 2 is comprised of 100 short set cards, followed by 50 shortprints that are seeded one per pack (two per for Jumbos). The SP’s in this series are called Sterling, Gamers, and then of course, Rookies. Of course, not every “rookie” is a true rookie card (Chavez, Beltran, etc. ), but there are a handful of decent actual rookies in Series 2, which include the likes of Alfonso Soriano, C.C. Sabathia, and A.J. Burnett. In this box, I pulled 96 short set base cards and 24 different shortprints, for 120 total cards (out of 150). There were 10 duplicates. Also, I should note that the Aaron/McGwire card in the scan happens to be one of the 50 shortprints, a very special card number 300 to finish off the set. Refractors (1:12 Hobby, 1:5 HTA): Regardless of which box you choose, refractors are going to fall at roughly two per box, though you may pull an extra or two (like I did here) from a Jumbo box if you’re lucky. Remember, there were only regular refractors and gold refractors (/100) at the time, providing a much simpler “rainbow” for collectors. I didn’t hit any golds in this box, but my regular refractors were of Jay Buhner and Mark Kotsay. Aaron Award Contenders (9 cards, varied seeding): In 1999, to commemorate the 25th anniversary of Hank Aaron hitting his 715th career home run, an award was created in his namesake. There would be one winner in each league based on a point system. Each player’s point total would depend on the number of hits, home runs, and RBI they recorded during 1999. The following season, the system was changed to a ballot system and has remained that way since. The inaugural winners of the award were Manny Ramirez and Sammy Sosa. This insert set featured nine players who were deemed odds-on favorites for the awards. The odds of pulling each particular player all differ. In most cases, there will be 2-3 of these cards per box, most likely of Alex Rodriguez, Mark McGwire, and Ken Griffey, Jr. I pulled the latter two. The hardest player from this set to pull (by far) is Juan Gonzalez (1:216 Hobby, 1:108 HTA). As for Topps’ predictions, they scored a 50%. Sammy Sosa is a part of this set while Manny Ramirez is not. A rare refractor version mirrors this set. Again, there were ten players for each milestone. With that said, you’re probably going to find a Hits Milestone card in your box like I did. My card was of Barry Bonds, (of course! This guy haunts me, though it’s not always bad) numbered 2039/3000. Double Feature (7 cards, 1:56 Hobby, 1:27 HTA): Here’s yet another insert that borrows a concept from Series 1. Similar to the Split Screen inserts from the previous series, the Double Feature inserts feature a pair of players on each card on opposite sides of a blue boundary going down the center. On each card, one of the player’s side of the boundary will have a refractor finish while the other will not. There are also variations in which both sides refract. They are a much tougher pull (1:168 Hobby, 1:81 HTA). The difference between this set and the Split Screen set is that the checklist here is exactly half of what Split Screen’s is (14 to 7) and the fact that ALL of the pairings in this set feature teammates, ideal for the team collectors out there. I pulled two Double Feature cards in this box. The first combination was of Chipper and Andruw Jones, with Andruw refracting on the right. The second combination was of Darin Erstad and Mo Vaughn, with Erstad refracting on the left. Future’s Finest (numbered to 500, 1:171 Hobby, 1:79 HTA): In this prospect-themed set, I pulled a 6’10” fireballing lefty from Seattle. No, not Randy Johnson! Ryan Anderson! A story about the former top pitching prospect in baseball, whose injuries and attitude had him out of baseball before age 26, can be found here. It’s still a very nice looking card, but I’ll have to find a Mariners fan to dump it off to. Despite having the same number of cards in each series, the blue cards in Series 2 actually have a little more generous odds than those in Series 1. Given the fact that I opened a regular hobby box, I didn’t have a chance to pull any of the Jumbo-exclusive Red and Gold parallels, but I did pull one very sweet Blue Refractor of Tony Gwynn, numbered 034/150! Just look at the insertion ratio on those if you will. What WASN’T Pulled: There wasn’t a lot I didn’t pull in this box! Like I previously mentioned, there were no Gold Refractors (/100), Aaron Award Refractors, or Double Feature dual refractors. First, there is the 7-card Complements set, which is just like the Double Feature set exactly in terms of both concept and odds. The only difference is that the combinations do not feature teammates (examples: Piazza/Pudge, Gwynn/Boggs, Jeter/Garciaparra). The last set would be the 10-card Franchise Records insert set which are tough pulls at (1:129 Hobby, 1:64 HTA) and also come with a refractor version. Final Thoughts: This box was LOADED! Whether it be hobby or jumbo (HTA), a box of 1999 Finest Series 2 will cost you less than $40 and will be a total blast to open! As is the case with Series 1, there are some really great, attractive, and unique inserts that are sure to please so go ahead and bust one!